To investigate the incidence, CT appearance, and implication for prognosis of the hollow adrenal gland sign (HAGS). A total of 194 patients with septic shock and 24 patients with hemorrhagic shock (as control group) were retrospectively included in this study and the patients with septic shock were further divided into four subgroups (digestive tract diseases, DTD, n = 49; biliary and pancreatic diseases, BPD, n = 41; postsurgical infection, PI, n = 64; and other diseases, OD, n = 40). 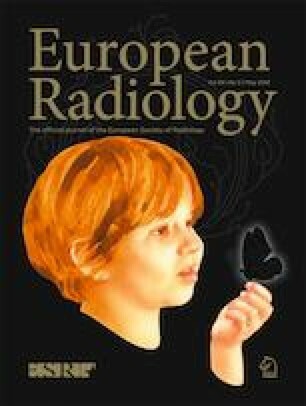 All patients underwent a dual-phase contrast-enhanced CT within 1 week after diagnosis. CT findings and clinical records were reviewed. If in the arterial phase the central zone of adrenal gland showed temporally much lower attenuation than the peripheral zone, it was defined as HAGS positive. The incidence of the HAGS in patients with septic shock and hemorrhagic shock, the demographic features, and mortality between HAGS-positive and HAGS-negative patients in each group were respectively compared. The incidence of the HAGS in the septic shock group was nearly 30%, while it was 0 in the hemorrhagic shock group. There was no significant difference in age or gender between HAGS-positive and HAGS-negative patients in all groups, while the mortality of HAGS-positive patients was significantly higher than that of HAGS-negative patients in each group (p < 0.05). The concordance correlation coefficient value showed excellent reproducibility of the two observers (κ = 0.977). The HAGS is specific and common on dual-phase contrast-enhanced CT in patients with septic shock and predicts a poor prognosis. • The hollow adrenal gland sign (HAGS) newly described in this study is a special enhancing pattern of adrenal gland on dual-phase contrast-enhanced CT in patients with septic shock. • The HAGS is characterized by the much lower-attenuated central zone of the adrenal gland in arterial phase and it showed excellent reproducibility between different observers. • The HAGS is specific and common on dual-phase contrast-enhanced CT in patients with septic shock and predicts a poor prognosis. Yang Peng and Qiuxia Xie contributed equally to this work, and they are co-first authors. The authors state that this work was funded by National Natural Science Foundation of China (No.81701747, Huanjun Wang). The scientific guarantor of this publication is Dr. Jian Guan.